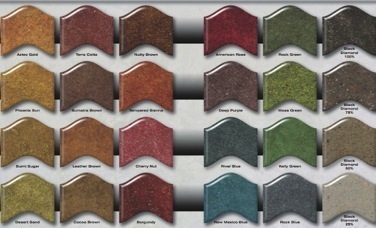 This one of many companies offering a selection of dyes for the concrete industry. This is the more “pleasing” set of selections, but you can get just about any color, including the brightest and the boldest! By itself is ok, but often, coloring the concrete at the pour, in combination with a dyed or stained surface, can produce some awesome results. This would be something we would be happy to consult with you about.